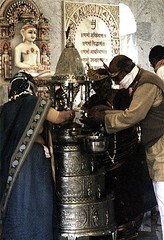 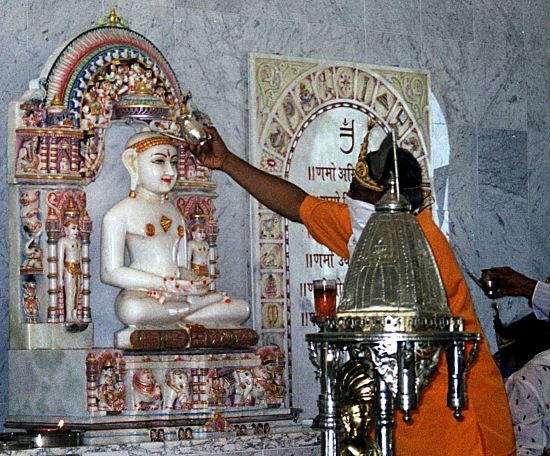 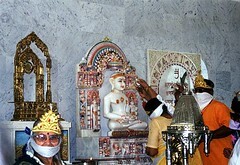 Jainism is one of India’s ancient traditions of life and practice. Jains affirm that each living being possesses a soul and, accordingly, the ethic of ahimsa or non-violence is central to the Jain tradition. 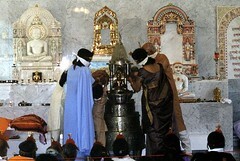 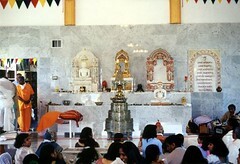 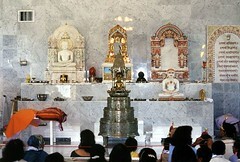 Jains first came from India to America in the late 1960s, establishing the Jain Center of Greater Boston (JCGB) in 1973. Since 1981, members of the JCGB have gathered in a former Swedish Lutheran church in Norwood; plans are now underway to develop a new, purpose-built derasar (temple). A second local organization, the Jain Sangh of New England (JSNE), formed in 2000. 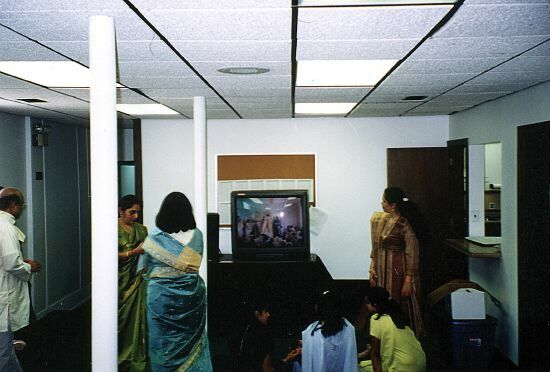 The JSNE is based in an office building in Woburn; they recently purchased a property in neighboring Burlington to establish a derasar. 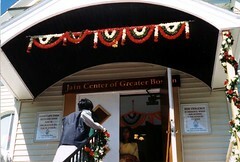 The JCGB and JSNE provide opportunities for worship and education for some 350 Jain families in Greater Boston. 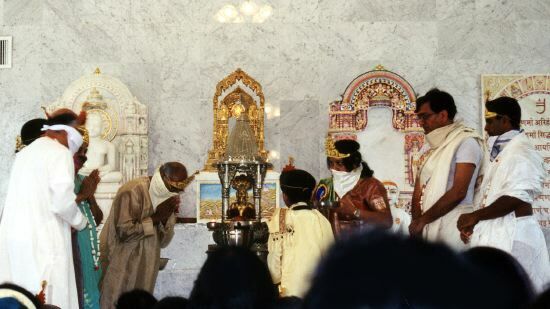 The ancient Jain tradition traces its spiritual heritage to a series of teachers called tirthankaras or “ford-makers,” those who spiritually crossed the river of this ever-changing life to become fully realized and liberated beings. 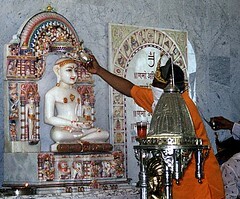 One of the most important of the tirthankaras, Mahavira, lived in India at about the time of the Buddha in the 6th century BCE. 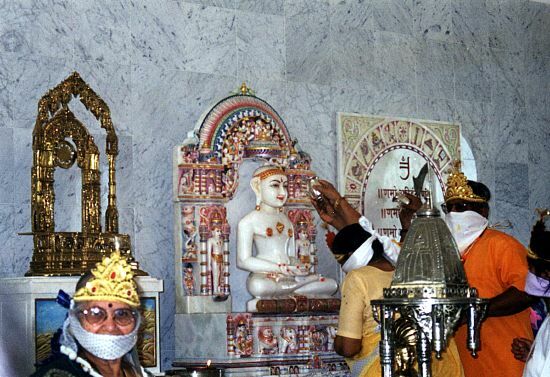 Because each soul may become liberated, the Jains have always had a strong ethic of non-violence, which extends to a positive respect for all forms of life, including animal life. Not surprisingly, the Jains who have immigrated to the United States have become an important voice in discussions of vegetarianism and animal rights. 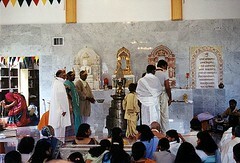 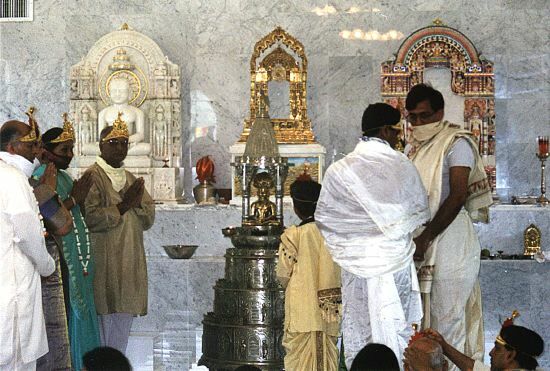 The Jain community first came to the United States in the late 1960s after the passage of Immigration and Nationality Act, which opened the door to wider immigration from Asia, and especially encouraged the immigration of “members of professions of exceptional ability and their spouses and children.” The first wave consisted primarily of Gujarati-speaking immigrants from Western India. 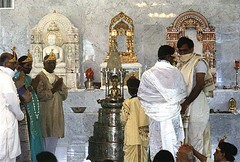 Later, political turmoil in East African states resulted in a second wave of migration of people of Indian ancestry and Jain belief. 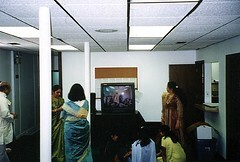 Many Jains came to Boston as students, meeting at the MIT Student Center and at the Rindge Tower apartments. 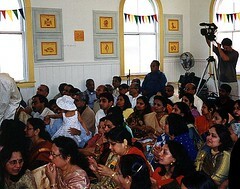 Some stayed to raise their families in Greater Boston, and continued to gather in private homes and rented facilities. In 1973, the community established a formal organization, the Jain Center of Greater Boston (JCGB). In September 1981, the JCGB established the first Jain temple, or derasar, in the United States: it is located in a former Swedish Lutheran church on a quiet street in Norwood. 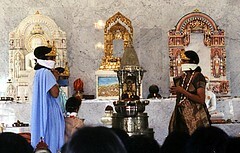 For nearly twenty years, members of the JCGB have gathered monthly and observed annual festivals at the temple. The JCGB’s pathshala programs, providing education in the Jain tradition, as well as the study of Hindi and Gujarati, are held off-site at a middle school in East Walpole, Massachusetts. In 2000, the Jain Sangh of New England (JSNE) was founded by a group of Svetambar Jain families in the Greater Boston area who decided to separate from the JCGB. 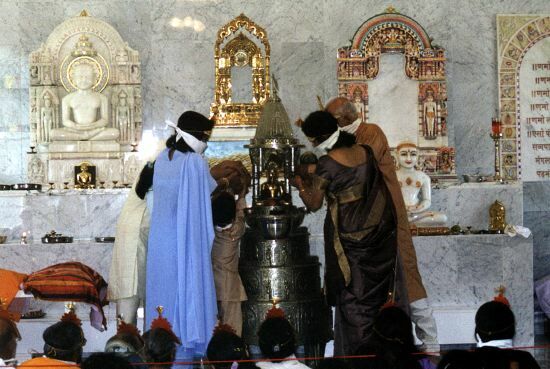 This new organization, JSNE, was established to promote “more traditional Jain practice for Svetambar Jains” in the Greater Boston area. 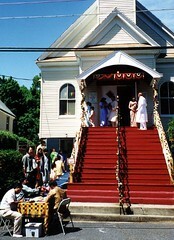 The JSNE first established a temple in an office space in Burlington before relocating to a professional building complex in Woburn. 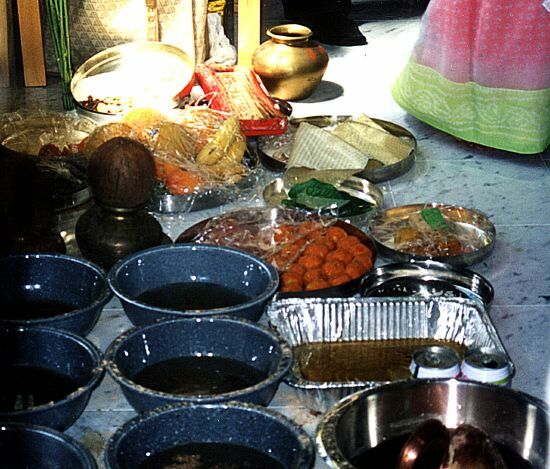 Their pathshala programs, held at a Middle School in neighboring Burlington, provide religious education for ages four through adult. 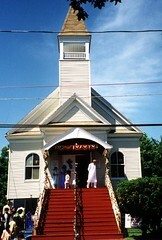 Recently, both the JSNE and JCGB have made significant progress towards the development of new, purpose-built temples: at the July 12, 2009 meeting of the JCGB membership, the community voted overwhelmingly in support of the purchase of a former synagogue in Norwood; on October 22, 2009, the JSNE purchased an office building in Burlington. 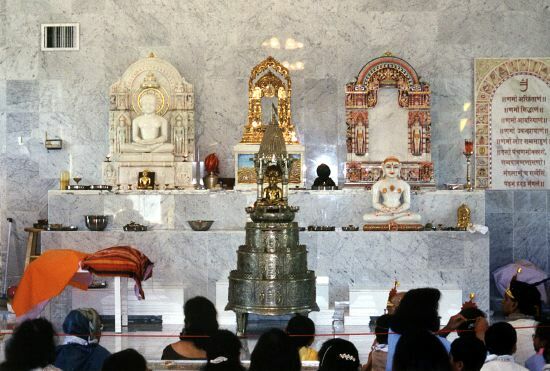 Once constructed and consecrated, these new temples will provide a sense of permanence—as well as dedicated space for worship and education—for some 350 Jain families in Greater Boston.